Pinch me because I think I'm in a dream. 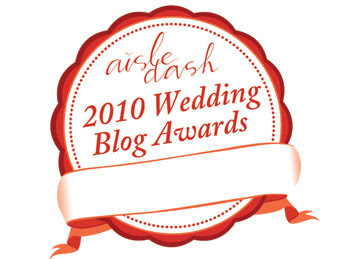 I am positively giddy over the great news that the cinderella project has won the award for Best Bridal Fashion Blog from AisleDash! When I started this blog I never though I would be seen by the likes of top industry professionals like Aisle Dash's Editor-in-Chief Anne Chertoff, world renown event planners Marcy Blum and Colin Cowie, lifestyle and entertaining guru Eric Hildebrand, celebrated bridal fashion expert Mark Ingram, and wedding and lifestyle media expert Liene Stevens. Thank you so much for the award - it truly is an honor. And a HUGE thank you to all the lovely readers and friends of the cinderella project who's continued support make this blog what it is. Best Magazine or Wedding Web Site's Blog: What Junebug Loves! Congratulations!!! YOU DESERVE THIS..... BIG TIME!!!!!! What a fabulous honor, and absolutely deserved! Congratulations! Congrat's on the well-deserved award! We love your blog! So many pretties ... all in one place!